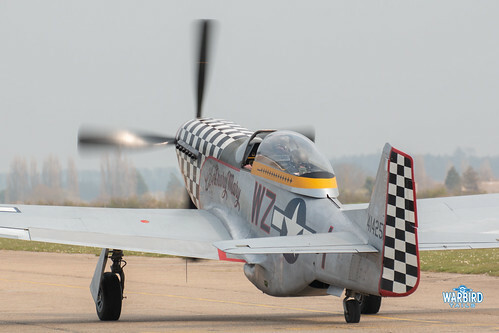 As the days start to get longer with the clocks moving forward the sound of aero engines and those long summer days suddenly don’t seem too far away. Over the coming weeks more and more aircraft will be coming out of hibernation ready to take part in the upcoming season together with new arrivals and restorations. Ahead of the start of British Summertime overnight I took an afternoon visit to Duxford yesterday (30th March) to take a look around the hangars and enjoy the spring sunshine. It turns out I picked a good day as it marked the first chance to enjoy some warbird action for 2019 and try out my new camera/lens combination (with some success!). On arrival at Duxford I was treated to the familiar sight of Spitfire IXT PV202/G-CCCA taxiing out to the 24 hold on the jet pan. 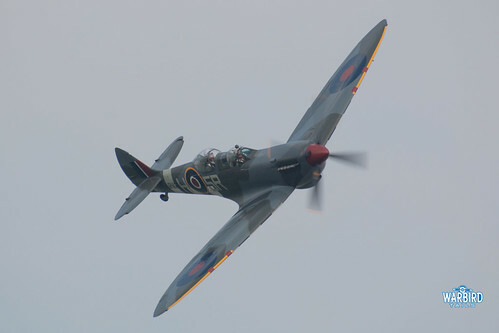 It’s easy to become used to the sight of a two seat Spitfire on sunny weekends these days with the exponential growth of the Spitfire rides market but it really is a treat that you can almost rely on a dose of Merlin magic with any Duxford visit now. This was also the first time I had seen ‘202 since the Aerial Collective launch and the red spinner makeover. 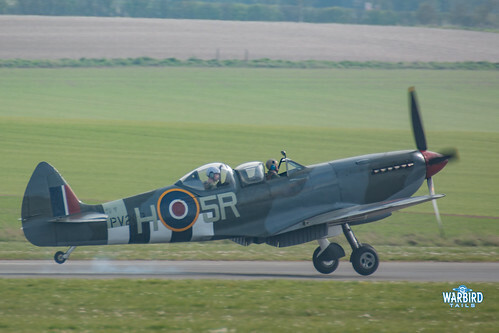 As part of the upcoming D-Day commemorations this Spitfire also now sports invasion stripes, making for a different twist on a familiar airframe. To my greater surprise, the Spitfire was joined at the hold by a star of 2018, TF-51D G-TFSI “Contrary Mary”, formerly “Miss Velma” operated at Duxford by the Fighter Collection, this airframe is now part of the Ultimate Warbird Flights operation based at Sywell and, at times, Duxford. 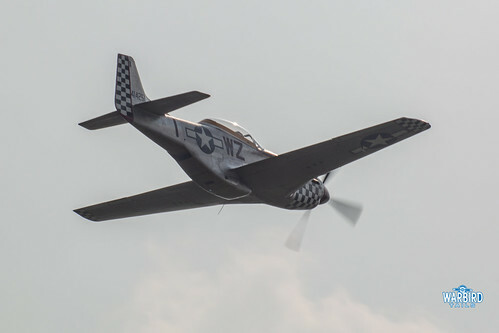 Following a forced landing at Flying Legends in 2017 the airframe emerged from Sywell in July 2018 in a spectacular 78th Fighter Group (based at Duxford) scheme. 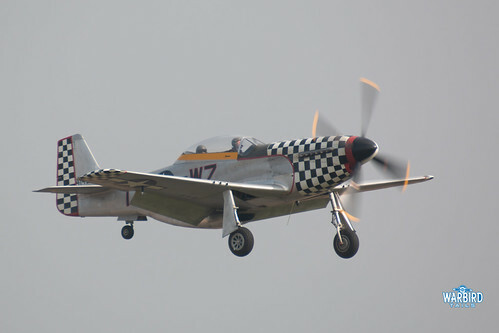 Having grown up with regular appearances from Rob Davies in “Big Beautiful Doll” it is great to have a Mustang in the UK skies in this scheme again. ‘Mary was on ride duty as well, flying a number of passengers throughout the day with a thrilling run and break into the circuit to end each flight. As if the Mustang/Spitfire duo weren’t highlight enough a third Merlin later joined the circuit, this time powering the Historic Aircraft Collection Hurricane G-HURI/”P3700″. 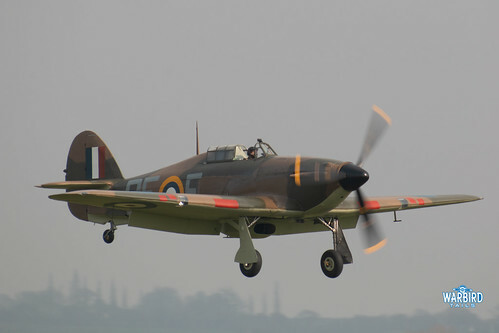 Another rare sighting at this time of year, the Hurricane had been to carry out an important flypast over the Hurricane excavation taking place on the Thames. As the ground crew put the airframe back in the hangar, the next project to hopefully take to the skies from the Historic Aircraft Collection fleet, the DH9, had a brief airing outside of hangar 3. 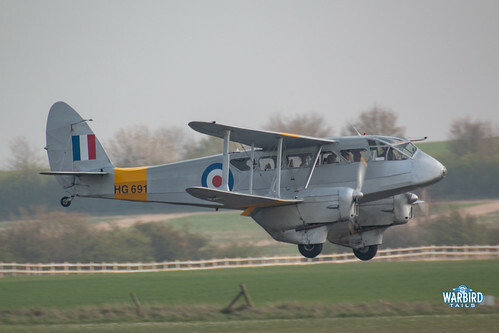 Together with the heavy metal operating throughout the afternoon there were also regular appearances from the resident Classic Wings fleet with several flights from the Dragon Rapide and a number of Tiger Moths. It was certainly an enjoyable afternoon and a timely reminder that the airshow season is certainly not far around the corner!